On a Cruise and want to SNUBA? 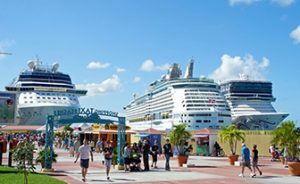 We are located only a 10 minute walk from the cruise ship facilities and are super easy to reach. There is no need to grab taxi’s. (You can just ignore the barrage of taxi and gypsy taxi sales pushers as you walk off the perimeter) If you book with us, we will be meeting you in Bobby’s Marina, right under the gazebo. It does not get any easier. Of course we do have contracts with a few cruise lines, so the chance might be that we are not able to book you directly. For instance, if you are on Royal Caribbean Cruise Lines on one of their bigger ships, or Carnival Cruise Lines (except CCL Fascination), you should turn to their respective Shore Excursion Desks or website pages instead. There are perks to booking thru them. We do reserve the right to cancel or modify your booking if we find you booked yourself into a time slot that does not comply with your available time on the island or if you are on one of the before mentioned ships. In any of these cases, we will contact you. Please do read our cancellation policy.